25 August 2009. Salisbury The Naim DAC is a true high-end product that can deliver an audiophile and, more importantly, a musical performance from virtually any digital source. It is also a truly convenient way to access music. The Naim DAC is the world’s first1 Apple authenticated high-end DAC, which means it can connect digitally to any iPod2 or iPhone and take the output digitally of anything that would have been sent to the headphone output. This includes UPnP streaming, the thousands of internet radio stations available via apps on the iPhone or iPod Touch and all the music stored on any iPod. The Naim DAC will be available in late September early October. 1 While the Naim DAC has passed all internal and first stage Apple approvals Naim expects final approval in two to three weeks. Click on an image to open a hi-res version. Note: they can take a second ot two to open. 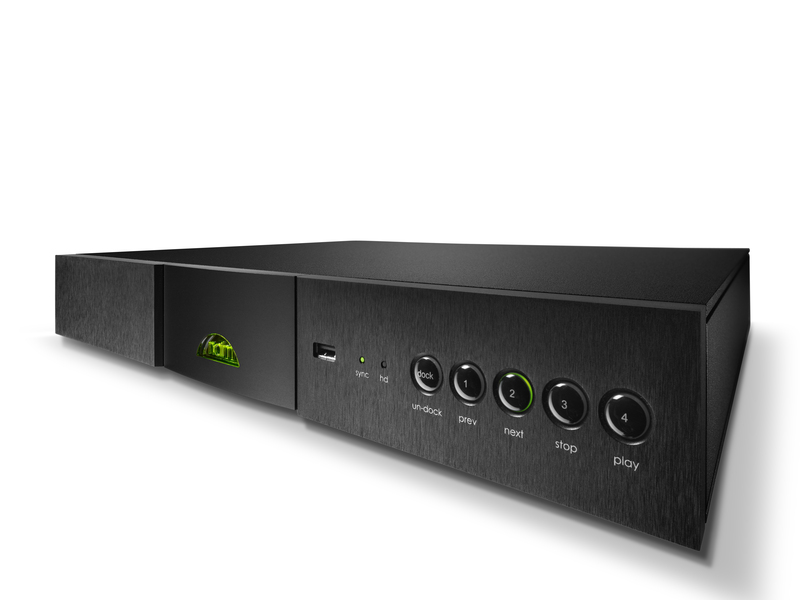 The new Naim DAC is a high performance zero S/PDIF jitter digital to analogue converter. It is power supply upgradeable, includes eight S/PDIF inputs: Two 75Ω BNC, Two RCA and Four TOSLINK (EIAJ optical). In addition, the Naim DAC includes a USB (Type A socket) on the front and rear panels, which facilitate USB memory stick playback and fully authenticated digital connection from an iPhone or iPod. What makes it a Zero S/PDIF Jitter DAC? Besides the usual attention to the finest detail for which Naim’s R&D is world-renowned and which will be obvious from the list of key points below, the special element of the design is the way in the Naim DAC that the master clock is not recovered from the S/PDIF signal as in other DACs. Instead, the incoming audio data from S/PDIF is stored in solid-state memory and then clocked back out to the DAC chips using a fixed-frequency local master clock. This eliminates jitter caused by S/PDIF. In essence the memory, master clock and DAC structure behaves in a similar manner to the CD, master clock and DAC structure of a CD player. The Naim DAC’s high-speed DSP (digital signal processor) front-end is electrically isolated from its high-resolution DAC and analogue circuits. The two sections are also run from separate power supplies significantly reducing the effect of RF noise (S/PDIF is a source of RF noise) from the S/PDIF circuitry on the DAC stage. The Naim DAC digital filtering is handled by an extremely powerful SHARC DSP chip running unique Naim authored code to create an ultra high precision 40bit floating point filter. The filter over-samples by 16 times on 44.1kHz data and provides stop-band attenuation of 156dB with virtually no pass band ripple. Following the digital filter are the DAC’s two mono Burr-Brown PCM 1704 digital to analogue converters, as used in the CD555 CD player. Finally, the Naim DAC features a very high performance, low noise, and low distortion fully discrete analogue output stage. All that technology – what does it sound like? Naim’s reputation has not been built on technology alone. It has been built on delivering sound quality driven by solid engineering, clever use of technology and of course consistent reliability and customer service. The Naim DAC is no exception; its musical performance is quite exceptional. It combines the detail, control, and accuracy of truly great digital playback with a musical sense of performance and inherent rightness that is a joy to listen to. Old and new recordings become alive, with a sense of renewed vitality and communication. 10 separate sine wave (Colpitts) generated clocks for lowest RF noise generation. iPod charging is switchable for best sound quality – Not charging sounds better. Front input buttons double as transport function buttons when USB or iPod is connected. Designed and manufactured in Salisbury England. We have all heard of jitter when talking about digital signals but very few of us truly understand it. We have all read on forums that it is digital so two digital cables cannot sound different. We have all heard the expression “bits is bits” usually expressed ironically by those just about to say two things sound different. Digital is an element of hi-fi reproduction where people can get very heated and opinionated. It is an area where Naim is quite confident to say there is more to discover. If we said that two sets of the same digital information (bits) in exactly the same order and at exactly the same time and including no spuriae like injected RF noise might sound the same, we should be a lot closer to reality. The truth is we do not know for sure. Along with other experts, we have views and opinions but so far that is all they are. The fact that there are no DACs that are truly source agnostic would indicate that the perfect DAC like the perfect mousetrap has yet to be built. However much experts might like to say they have all the answers we know they do not. We learn more every day. One very good reason for a firmware upgradeable DAC. The DAC designer is dealing with high frequency information (bits), timing information (clocks) and RF noise affecting both, before the more conventional elements of power supply, case, microphony, and of course control functions. It all makes for an interesting time. Given the number of potential digital sources available now it was only logical that Naim’s R&D started a project to design a standalone Digital to Analogue Converter (DAC) that was sonically comparable to a high-end CD player. Naim’s digital design philosophy was that the digital audio master clock must be positioned close to the DAC chips. This philosophy has always required Naim to design one box CD Players in terms of their analogue and digital circuits. Some of course had an external power supply. Designing a consumer DAC so that the master clock can be in the right place, all the jitter that adding the DAC could add is eliminated and where it’s technically possible to improve on the off the shelf digital filters has been, until now, a desire rather than a possibility. Now it can be done. “Made for iPod” means that an electronic accessory has been designed to connect speciﬁcally to iPod and has been designed to connect specifically to iPod and has been certiﬁed by the developer to meet Apple performance standards. “Works with iPhone” means that an electronic accessory has been designed to connect specifically to iPhone and had been certified by the developer to meet Apple performance standards. Apple is not responsible for the operation of this device or its compliance with safety and regulatory standards. iPod and Mac are trademarks of Apple Inc., registered in the U.S. and other countries. iPhone is a trademark of Apple Inc.
iPod and Mac are trademarks of Apple Inc., registered in the U.S. and other countries. SHARC is the registered trademark of Analog Devices, Inc.